Water Lettuce has velvety foliage that spreads like strawberry plants across the surface; they may produce inconspicuous white flowers. The bright green leaves are deeply veined and resemble heads of floating lettuce; they grow to lengths of up to 10 inches and up to 4 inches wide. 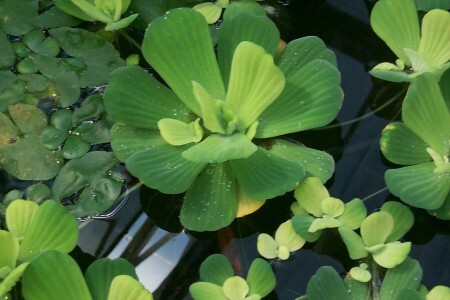 Water Lettuce helps to provide shade for the pond and fish, as well as a safe haven and spawning area for the fish. They help oxygenate and clarify the water and will use the extra organic nutrients in the pond, thereby reducing algae production. Water Lettuce seems to prefer some shade in warmer climates, but is also susceptible to frost, and even a brief exposure to frigid temperatures produces scalded leaves that quickly turn to rotting areas. AquA AnimaniA is your #1 local source for Water Lettuce along with a large selection of healthy live aquarium plants and other robust pond plants. We also feature a wide variety of small animals, pets, aquarium fish, pond fish, amphibians, reptiles and more! To properly care for your pets, we also carry a comprehensive and extensive line of pet supplies including equipment, foods, treats, aquariums, tanks, cages, supplies and toys for dogs, cats, birds, small animals, amphibians, reptiles, fish, exotic pets and critters.